General Motors Shares Jump In Return To Market GM roared back to life with one of the largest initial public offerings in history, offering up to $23 billion in new stock as the federal government sold off the majority stake it took last year in exchange for a taxpayer-funded bailout. 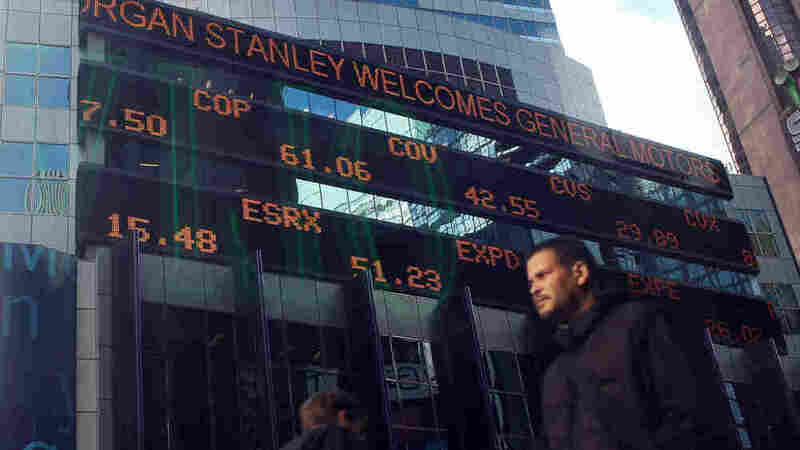 An electronic ticker on the Morgan Stanley building in New York City on Wednesday welcomed General Motors' return to the U.S. stock market. Eager investors snatched up stock in a leaner, meaner General Motors on Thursday, sending the share price up as much as 9 percent in a public offering worth upwards of $20 billion that was partly intended to draw down the government's majority stake. The stock rose sharply in its first day of buying and selling, at one point going for nearly $36 a share — $3 more than the price GM set for the initial public offering. It pulled back a bit to to close at $34.19 a share, a 3.6 percent gain for the day. "It's a wonderful day for the company," GM's chief financial officer, Chris Liddell, said in a morning conference call. "There was a huge amount of interest in the retail funds and mutual funds" about the IPO, he said. President Obama spoke briefly at the White House after the markets closed to make note of the stock sale. "American taxpayers are now positioned to recover more than my administration invested in GM," he said, adding: "And that's a good thing." "We are finally beginning to see some of these tough decisions that we made in the midst of the crisis pay off," the president said. "I believe we're going to get through this tougher and stronger than ever before." Without the bailout, Obama said, nearly 1 million jobs would have been lost across all 50 states. Less than 18 months after declaring bankruptcy, a leaner, meaner GM -- free of debts and refocused on efficiency -- hit Wall Street with one of the largest initial public offerings in history. 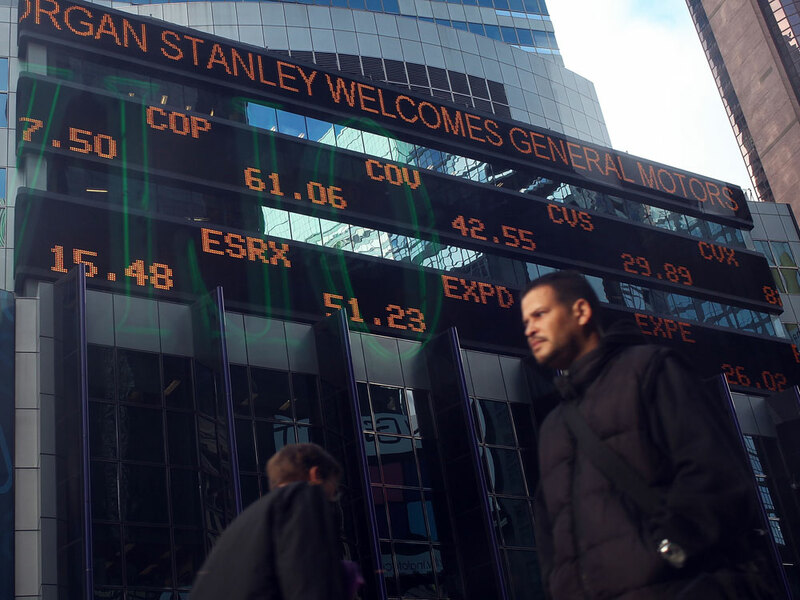 The federal Treasury unloaded about 400 million shares, reducing its stake in GM from 61 percent to about 36 percent. The government would have to sell the remainder of its stake, 500 million shares, in the next two to three years at a price of $53 for taxpayers to break even. GM set a price of $33 per common share on Wednesday, a day after it raised the number of shares it will offer to satisfy investor demand. The U.S. government and other owners raised about $18 billion when they sold their shares. GM reportedly made nearly $5 billion by selling 100 million preferred shares at $50 each. Together, the sale of common and preferred stock could bring the deal's value to more than $23 billion. GM's main joint venture partner in China, SAIC Motor Corp., quickly snapped up about a 1 percent stake. The Shanghai-based, state-run SAIC said Thursday that it paid nearly $500 million for about 0.97 percent of the American automaker. Overall, there's been "a lot of interest internationally" in the GM IPO, said Aaron Bragman, a research analyst with IHS Global Insight. "From what we're hearing, CEO Dan Akerson is doing a really good job of selling the company overseas," he told NPR. Bragman said the fact that GM has been able to climb out of a hole in the middle of a recession has excited investors. "This isn't about where GM is today, but about the prospects for profitability in the future," Bragman said. "The bankruptcy allowed GM to shed a lot of the bad stuff on its balance sheet and that puts the company in a good position going forward." Kirk Ludtke, a research analyst at CRT Capital Group said the IPO has sparked considerable interest because GM is "a household name." The new offering, he said, "pulls a lot of levers" in the investor psyche. The IPO is a huge milestone on the road to recovery for an automaker that looked all but dead — it was saddled with the epithet "Government Motors" — after it declared bankruptcy in June 2009 and accepted $50 billion as part of a government rescue. The value of its old stock, which had been trading for less than a dollar, was wiped out, along with $27 billion in bond value. Since then, GM has eliminated some divisions, laid off tens of thousands of employees and reduced vehicle prices — efficiencies that helped it turn a profit this year. But it was the bankruptcy that really saved GM, according to IHS Global's Bragman. "And the fact that it was a government-led bankruptcy was also extremely helpful, because it pushed the process along more quickly," he said. Obama said Wednesday that GM's IPO marks the beginning of a turnaround for the entire U.S. automobile industry. He said the auto industry bailout "required tough decisions and shared sacrifices, but it helped save jobs, rescue an industry at the heart of America's manufacturing sector, and make it more competitive for the future." Senior Obama administration officials said the Treasury Department was seeking to strike a balance between getting a return for taxpayers and exiting government ownership as soon as practical. "The reason they're not selling [their stake] all at once is that they don't want to push the share price down," Bragman said. GM CFO Liddell said he spoke with car czar Ron Bloom “once or twice a month” after the government took a controlling stake in the company, and that he anticipated doing the same even after the government drew down its stake. Most of GM's new stock went to institutional investors, but GM set aside 5 percent for employees, retirees and car dealers to buy at the offering price. The deadline to sign up was Oct. 22, but indications were that few individuals took the offer. Sean McAlinden of the Center for Automotive Research said it's understandable that individual investors would be reluctant to get in the passenger seat with GM again. The last set of shareholders and bondholders in GM got wiped out, he said, so individual investors would now have to wonder, "Why should I trust [GM] now on nine months' worth of results?" The GM debut comes at a time when auto stocks are generally performing well. Rival Ford has seen its share price rise steadily this year, from about $10 in January to about $16.50 as the GM IPO approached. Ford's stock traded for $1 in November 2008, but the company never took bailout money.